Growing your dream company can have some challenges along the way. With the rate that companies go out of business and fail, here are 8 challenges to consider, along with advice on how you can avert disaster before it strikes. Starting for the Wrong Reason – According to Forbes, more than 500,000 business are started each month – and many for the wrong reason. If you start for the right reasons, such as having a positive mindset that keeps you going no matter what. Some reasons not to start a business is if you think you’ll automatically make millions, or you just want control of something. Insufficient Capital – Starting a business without any capital is almost a death-knell. Most business owners underestimate the initial investment and ongoing expenses it takes, failing to manage proper cash flow. Protecting your capital can give you a good buffer for the ebbs and flow in your business. Improper Planning – Lack of planning is another reason many businesses fail and go out of business. Create a business plan and review annually. Regardless of length – planning is critical. 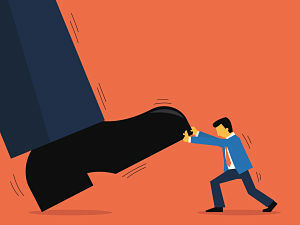 Poor Management & Leadership – Effective management and leadership skills are essential to building success – lack of either can lead to confusion and conflict within the business. Make it a priority to acquire the skills you need to strengthen areas where you are weak. Expanding Too Quickly – Too often a company can experience bankruptcy as a result of expanding too quickly. Make sure you research and analyze what you’ll need for new employees, facilities and systems and make sure you can manage it. Failure To Advertise and Market – Many companies go out of business purely because the owner failed to promote and market. In 2016, nearly half of companies did not have a website (Forbes, 2016). Make sure your website is updated and can be easily navigated, set up social profiles and social networks, start an email newsletter and advertise on google, or wherever your target audience is found. Lack of Differentiation – Unique Value Propositions, described the qualities, characteristics, products or services that differentiate a business from its competitors. Once you understand your UVP, it will make it easier to communicate with your clients and employees. Unwillingness to Delegate – Business owners can be their own worst enemies, in that they seek to do everything themselves. Learn to delegate work to others while concentrating on the tasks that contribute to the growth of the company. To learn more business tips, visit the rest of our resources and blogs.